The play "Miura no Ôsuke Ôbai Tazuna" was originally written for the puppet theater (Bunraku) and staged for the first time in the 2nd lunar month of 1730 in Ôsaka at the Takemotoza. It was adapted for Kabuki a fews months later and staged for the first time in the 8th lunar month of 1730 at the Kado no Shibai. It was staged for the first time in Edo in the 6th lunar month of 1795 at the Kiriza [casting]. Then, it went into oblivion for more than 2 decades. It was revived by the Kamigata star Nakamura Utaemon III, who revised the script for the third act under his pen name of Kanazawa Ryûgoku I. It became an independent drama, staged in the 3rd lunar month of 1821 at the Kado no Shibai under the title "Kajiwara Heizô Kôbai Tazuna" [casting] and in the 11th lunar month of 1822 at the Kitagawa no Shibai under the title "Kajiwara Heizô Kidai no Ishikiri" [casting]. The title "Kajiwara Heizô Homare no Ishikiri" was used for the first time in June 1892, in Nagoya at the Suehiroza. The drama "Miura no Ôsuke Ôbai Tazuna" was made up of 5 acts and its most famous scene, which was the final one in the third act, became an independent drama staged on different titles, the most famous one being "Kajiwara Heizô Homare no Ishikiri". This scene is commonly called "Ishikiri Kajiwara" (literally "stone-cutting Kajiwara"). Ôba Saburô and his bombastic villainous brother Matano Gorô, who are both Heike warriors, are at a shrine in Kamakura celebrating their recent victory over the enemy general, Yoritomo, when Kajiwara Kagetoki, who also fought in the same battle, enters and joins them. 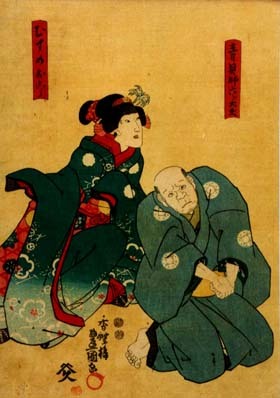 An elderly man and his daughter then appear and approach Ôba. Old Rokurôdayû wishes to sell a precious sword in his possession to help his daughter Kozue, and asks Ôba to buy it. Just as Ôba is about to go ahead, his brother objects and says that before anyone parts with 300 gold pieces he wants the sword examined. Kajiwara, who is known to be an outstanding swordsman, agrees to examine the sword. As he does so, he notices not only its excellence but sees something on the hilt that indicates the sword is a treasure of the enemy Genji, but he keeps that information silent. Kajiwara gives the sword his unqualified approval, and the sale is about to through again when Matano says that if it doesn't cut well it is more useless than a rusty fish knife, and insists that it is tested-by cutting two condemned prisoners in half. The prison official reports that unfortunately there is only one prisoner currently under the death sentence, so Ôba says that he cannot buy the sword and readies himself to leave. Rokurôdayû, however, is desperate to sell the sword because he is secretly a Genji sympathizer and he needs the money to give to the Genji cause, so he offers himself as the second body, on the understanding they give the money to his daughter after his death. Matano is satisfied and plans to do the slicing himself, but Kajiwara intervenes and says he will test the sword. The condemned man is brought in and lain on top of Rokurôdayû. Kajiwara brings down the sword with precision, but only the criminal is killed. Rokurôdayû is still safely in one piece. 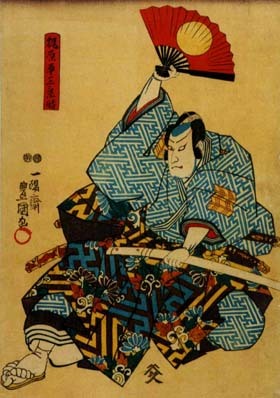 Matano is disgusted that the sword has failed its reputation and leaves with Ôba. Kajiwara then reveals that he deliberately gauged the power of his stroke so that Rokurôdayû would not die. He, Kajiwara, recognizes the power and significance of the sword, and will buy it for himself, for he is also secretly a Genji sympathizer. And to prove the sword is in no way defective he brings it down on a stone water trough, cutting it clean in two. All three are delighted with the outcome and leave for Kajiwara's mansion to settle payment.